Zeiss Victory Rangefinders are available in both binocular and monocular models. The Victory RF rangefinding binoculars (8x and 10x with 45mm or 56mm objectives) sport Zeiss's legendary FL fluorite objectives for bright sharp views. The Zeiss Victory Pocket Rangefinder (PRF) has 8x26 FL optics, and as the name implies, can fit in a pocket. All Zeiss rangefinders have their lenses coated with LotuTech hydrophobic coatings. The electronics incorporate Zeiss's Ballistic Information System (BIS) which accounts for differences in elevation and muzzle velocity for accurate hold-over readings. Victory RF Binocular RangeFinders Now with Victory HT Glass! Zeiss Victory RF Binocular Range Finders are the world’s first binoculars with integrated laser range-finder, premium Zeiss optics, and a sophisticated Ballistic Information System (BIS). Available in either 42- or 54-mm objective sizes, Victory RF binoculars give you legendary Zeiss optical quality at 8x or 10x magnification. The BIS provides exact holdover values for maximum accuracy at long range. 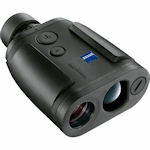 The Zeiss Victory 8x26 T* PRF is a digital laser range-finding monocular with LED display and integrated BIS (ballistic information system) ballistic calculator. 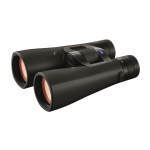 The 8x magnification brings the target into sharp clear focus; then touching a button provides distance and holdover instantly.